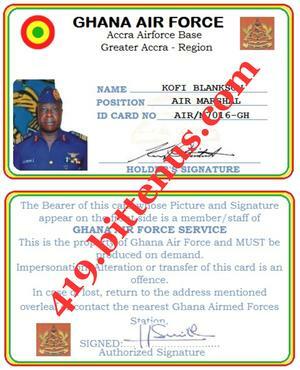 The Ghana Air Force Unit 13 has retrieved two trunk boxes containing an amount of US$6 million from 4 Customs officers who connived to remove the trunk boxes from the bonded warehouse at the Kotoka International Airport.Investigations revealed that the boxes were deposited at the bonded warehouse under your name which is why I have contacted you. I am the Sector Commander of the Unit,I have attached a copy of my id to back this point. You can ask a trusted representative to come and sign for the hand over of the trunk boxes to him/her or I can with your authority obtain an affidavit to arrange the wire transfer of the funds to you.